Seafood on pizza isn’t a new phenomenon. At Pepe's in Connecticut, clam pizza has been a regional specialty for years. In the 1980s, fancy restaurants began jumping on the bandwagon, offering shrimp and seafood-topped pies that raised pizza from a kid’s party food to haute cuisine. When I was slinging pizza at Figs in the 90s and early aughts, spicy shrimp pizza was one of our most popular offerings. 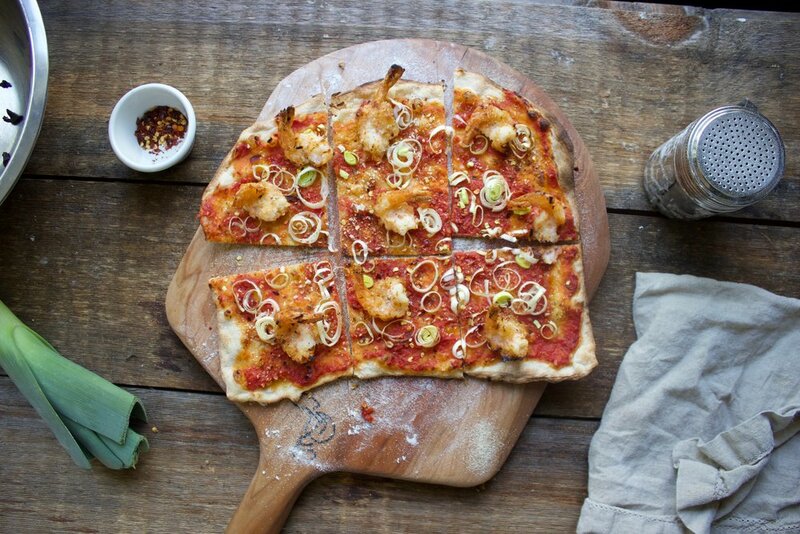 Something about the spice and the juicy texture of shrimp on pizza proved irresistible. Well, the combo still works, so I’m going to “leak” this secret to you, with a few little twists of my own. I’ve created a spicy coconut coating for the shrimp, and combined it with flavorful leeks for a flavor that will blow you away. Preheat your oven at 500F with your Baking Steel on the top rack. On a lightly-floured work surface, shape the dough by hand into a circle roughly 5” in diameter. Then, using a rolling pin, roll it horizontally and vertically to work it into a circle about 1/8” thick and 11-12 inches across. Knock out any additional air bubbles by hand. Lift your dough onto a lightly-floured pizza peel before topping. Season your tomato sauce with red pepper flakes to taste. Evenly distribute the tomato sauce across the top of the pizza, leaving about 1 inch around the perimeter for the crust. Evenly distribute the shrimp and leek slices across the top. Scatter with bread crumbs. Use a generously floured pizza peel to launch your pizza onto the Baking Steel and bake under the broiler for 2 minutes. Launch pizza onto your Baking Steel and broil for 2 minutes. After 2 minutes, open the oven and use your pizza peel to give the pizza a 180-degree turn. While the oven door is open, carefully scatter the coconut on top. Turn off the broil setting but keep the oven at its highest temperature, and continue cooking for another 1-2 minutes, or until the cheese has attained your desired brownness. Use your pizza peel to remove the pie from the oven. Top with oil and crushed red pepper flakes. Slice and serve.